In honor of the soon-to-be box office hit I Love You, Man and the backdrop of the interracial romance between Rashida Jones and Paul Rudd, Blindie revisited the black woman-loving-white man film romances in our time. Here's our stab at listing the Top 5 interracial onscreen couplings that not only entertained us, but sent us a message: 1. Flirting: Shy Danny Embling (Noah Taylor) falls for Thandiwe Adjewa (Thandie Newton) and their romance blossoms over the course of the school year in this 1991 cult classic. Danny could've easily fell for Naomi Watts and Nicole Kidman in the flick, but he opted for the Kenyan spark plug! 2. 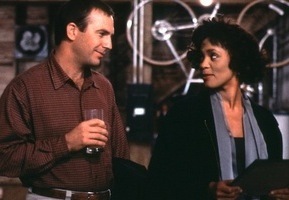 The Bodyguard: The 1992 hit film starred Whitney Houston as a demanding diva that reluctantly hires Kevin Costner to help protect her from a psychotic stalker who wants her dead. Costner's protective ways helps him fall in love with the diva he's protecting. 3. 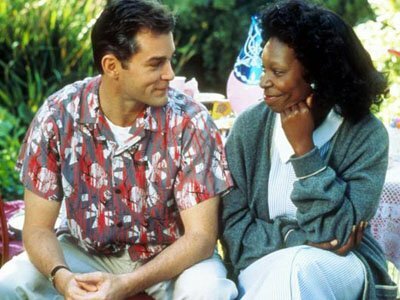 Corina, Corina: The 1994 comedy with heart followed housekeeper Corina Washington (Whoopi Goldberg) as she helps young Molly cope with the death of her mother. Corina definitely helps Molly out of her muteness, but it's the sparks between Corina and Molly's widower father (Ray Liotta) that really shook things up. 4. Guess Who: The 2005 take on the 1967 classic featured Zoe Saldana bringing her white fiance (played by Ashton Kutcher) home to her skeptical black father (played by the late Bernie Mac). In the end, love conquers all--and daddy accepts her white boy! 5. Something New: The 2006 mainstream romantic comedy found Sanaa Lathan's Kenya McQueen trying something new during a blind date with a hunky landscaper Brian (Simon Baker), who happens to be white. And who couldn't fall in love with a man that helps you embrace your natural curl?